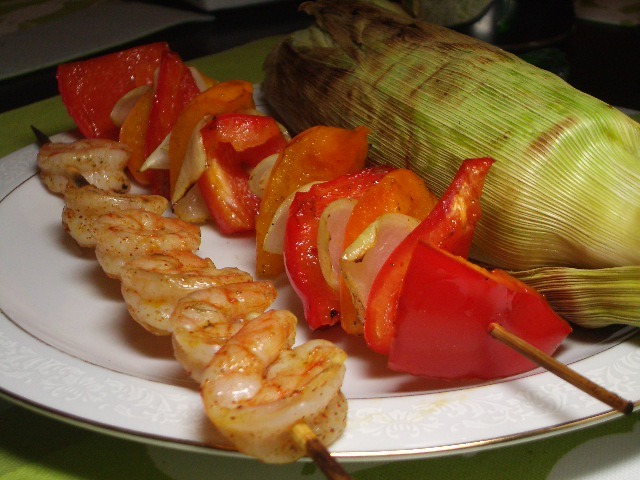 Peel the shrimp and cut your peppers and onions into bite-sized skewer-appropriate pieces. Skewer the shrimp and peppers. As you can see, we put them on separate skewers to maximize the shrimp’s exposure to the marinade. You could also mix and match between the veggies and the shrimp. In a small bowl, combine the olive oil and spices. Whisk in the lime juice until it’s incorporated. Put the skewers in a shallow baking dish (with sides!) and pour the marinade over them. If you’re using a charcoal grill, like we do, you’ll probably want to get your coals going early to get it nice and hot. If you have a gas grill, you’ll want it hot, too, but it won’t take as long. Take two ears of corn in their husks. Put them on the grill about 10 minutes before the peppers. Turn occasionally. Take them off when you take everything else off. Enjoy with butter, salt, and pepper.